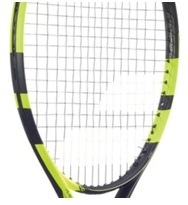 There are numerous factors that go into choosing the best racquet for any given player. Weight, balance, head size, stiffness, etc. One piece that is often overlooked or not known is the frame construction. How the frame, more specifically the beam and throat, is constructed plays a significant role in how the racquet will play. Let’s get geeky with beam and throat shapes. The oblong shape, similar to an oval, is the strongest design. When the ball strikes the string bed, the string bed and frame flex from the impact. The stronger the frame, the less the frame flexes which results in the string bed flexing more and producing more power. The thicker the beam, the less the beam will flex. (The beam is the “oval” part of the frame.) The ball leaves the string bed before the beam returns to its original position, therefore no power is produce from the “snap back” of the beam. The elongated beam is still strong but slightly weaker than the standard oblong beam. This means the elongated oblong beam will flex slightly more than the standard oblong beam. When the ball hits the string bed, the beam flexes more, preventing the string bed from flexing as much as it would if it were the standard oblong shape. This beam shape produces slightly less power than the standard oblong shape beam. The square-ish beam is the weakest beam design. The beam will flex significantly when the ball strikes the string bed, preventing the string bed from flexing as much. Due to the beam flexing more, the string bed flexes less, which results in less power being produced by the strength of the beam. The same information is true for the throat of the racquet. The weaker the throat, the more the racquet will flex/bend on impact, which will result in less power being generated from the frame. Which frame construction is the best one for me? This depends on how you play, what you’re looking for out of a frame, whether you only play doubles/singles or both, and your playing style. For the frames that flex more, or are weaker, the player must generate more power on their own using their body. If you hit the ball very hard and can produce a lot of power but are experiencing difficulty keeping the ball in or controling the ball, a racquet with a weaker frame (elongated oblong or square-ish) would give you the control you’re looking for. Most players who try out a racquet that produces less power say that they gained a lot of control, when compairing to their racquet that has stronger construction and produced more power. What is really going on is that their power was reduced slightly and they were able to control the power they produced much better, resulting in their game improving. Doubles players would love a racquet with the square-ish beam and throat since these racquets provide the ultimate feel and touch. The player decides how far a volley or half-volley will go. With a stiffer/stronger racquet, the volleys will always be more powerful even if you don’t move the racquet. Players that might want to try a racquet with a weaker beam and/or throat include: doubles players, serve and volleyers, attackers, and power hitters that are looking for more control. The racquets with a oblong beam and throat, such as the Babolat Pure Drive, are stiffer and will produce more power due to the string bed flexing more upon impact. 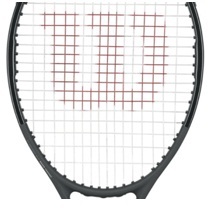 These types of racquets are for the player that has difficulty producing big power. Using their same stroke, more power will be generated with a racquet of this type. If a player is able to produce very high topspin, then that player might be able to control the power produced from a all oblong racquet. For example, Rafa Nadal produces up to 5500 RPMs on the ball which allows him to hit the ball with a lot of power but still be able to have the ball drop in the court. Players seeking more power should try out a racquet that has an obling beam and throat. The elongated oblong racquets are a mix of the two types previously discussed. They range in flexability and try to harness the best of both worlds, power and control. These racquets will vary in how they feel and perform, so try out a couple different models from different companies to find the best one for you and your current playing needs. If you play mainly singles but also play doubles every now and then, this might be a good option for you. Whenever seeking a new racquet, always try them out before you buy. 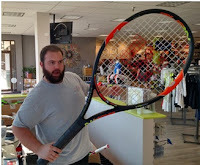 I hope this information helps you find the best racquet for you.